First published in 1990, this collection investigates grammatical categories associated with the verb as they are used by speakers and writers in real discourses and texts. Focusing on tense, aspect, mood, and voice in French, Spanish, and Italian, each chapter underscores the importance of context in our understanding of how grammatical categories work. Above and beyond their basic ‘grammatical functions’, categories of the verb are shown to operate in such capacities as structuring information in discourse, establishing point of view in a text, and creating textual cohesion. Importantly, this volume reflects the crucial role discourse-pragmatics factors play in our interpretation of the meanings of categories of grammar. Discourse analysis is a wide ranging area of study that examines the features of language beyond the limits of a sentence — including vocal, written and sign language, along with any significant semiotic events. It has been employed from a number of interdisciplinary perspectives in an attempt to reveal a person’s socio-psychological characteristics through the practical analysis of naturally-occurring language rather than artificially created examples. 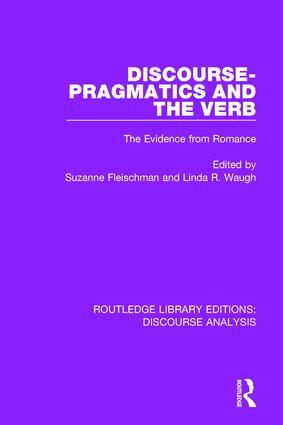 Routledge Library Editions: Discourse Analysis brings together an extensive collection of scholarship that reflects the broad scope of the subject area, examining the relationship of discourse to a number of closely related fields including stylistics, pragmatics, speech, conversation, context, anaphora, grammar and psychology. This set, published between 1979 and 1993, provides a thorough grounding in this key discipline for students of linguistics and psychology, and social sciences in general.